New Machin Printings wrapping things up for Christmas. 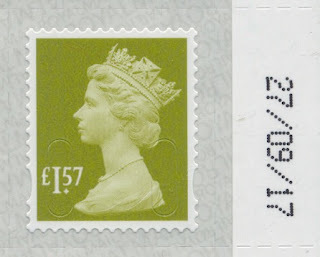 As we expected they might, some low value Machin reprints have now appeared, rounding off most of the sheet stamps on Security Printed Backing Paper (SBP) - we never really believed the 50p and £1 would be reprinted. 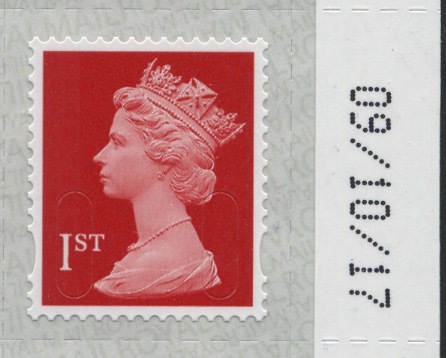 The 2p and 10p counter sheets first appeared in June and April respectively with plain backing paper. Now we have the reprints on version 2 of the security printed backing paper. The 2p seen has SuLi-SiLu arrangement and the 10p has SuLu-SiLi, for the record. 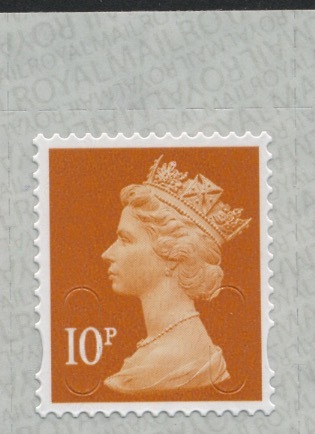 The backing paper for the 10p is also much paler, almost impossible to scan. These were scanned on the same settings. The 2p was printed on 24/10/17 and the 10p was printed on 26/09/17. Both are printed from colour cylinder D2, and iridescent and phosphor cylinders D1. 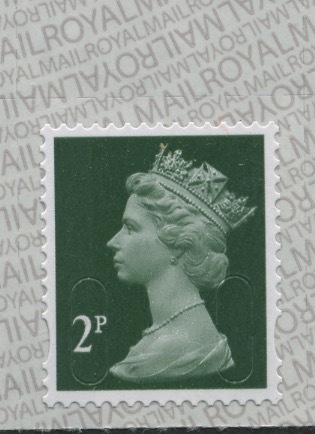 There have been reprints of four other stamps as well, again showing marked differences in the backing paper. I'm recording the lettering arrangement for information only: I'm not recording all of them in our Checklist - for which a new version will be released very soon. The 5p printed 03/10/17 has dark backing printing; the £1.57 printed 27/09/17 has pale; the 1st class printed 09/10/17 has pale, and the 2nd class printed 24/10/17 has dark. The 2nd class is SiLuSuLi. The 1st class is SuLuSiLi. The 5p is SiLuSuLi, and the £1.57 is SuLuSiLi. New stamps will be added to our shop shortly, and to the checklist. Note that shop orders - especially international ones - may not be posted before the Christmas holidays, which means they will wait until the first week of January. Thanks for the information about the new printings. I'm afraid that I don't think that I like the way of describing the direction of the backing paper much though. I felt an initial gasp of horror at seeing an exppression like SiLuSuLi. What does it mean? Than after I'd worked that out the feeling remained. How complex. How unmemorable. It even seems to have confused you. I notice that you include both SuLi-SiLu and SiLuSuLi. But rotating the letters around these are the same thing!! The problem is that the notation is too flexible, and therefore too complex, for its purpose. It allows you to describe any of the 24 permutations of the order in which the lines of text can occur. But you don't need to do that. You only need to be able to describe 2. The backing is either upright or inverted. Machinmaniac - I agree. Simples ! I did have an error on the £1.57 but only be typing it as something that can't exist! You start with the Large line first, I start with the small line first. If you start with the Small line first then if the second (Large) line is upright, that is two uprights in a row, as with the original SBP1. You see why an 8 letter code is more precise? It rather depends on whether you start with a small row or a large row! But as I have written before, I don't really care, and in future I won't mention it! I really don't see the problem. I did explicitly state that I was starting from a large upright line. I was simply trying to state an easy rule for working out which of the two backing paper variants you have. A rule which has worked well for me. I never claimed that this was the only way of determining which type of backing paper you have. I merely said "here is a method that works". You can obviously start with any of the four types of lines of text and look at the line immediately above or below, and invent your own mnemonic. The thing about all of these though is that, whichever method you choose, you only ever need to look at two lines. You never need to look at all four. It is just not that complicated. 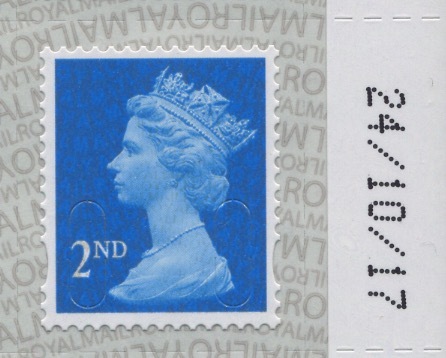 I assume that people have spotted that the backing paper is actually the same in both varieties. The only thing that's different is how its fed into the printing machine, one way up or the other. Oh yes, that is well known, but it didn't have to be like that if they had made one pair of rows a mirror of the other. That's what I drew attention to in the first place around 12 months ago. Hope of interest? I am not a Machin nutter and do not go out of my way to collect every combination but if I am at a PO counter and it's quiet, I will have a look to see what's available. One day in the distant future no doubt someone will display at Stampex a specialist Machin study of backing papers! Yes, I agree with Doug that this may not be something for the many people who just collect singles. I'm not aware of anyone (yet) asking significant sums for allegedly "rare" variants. 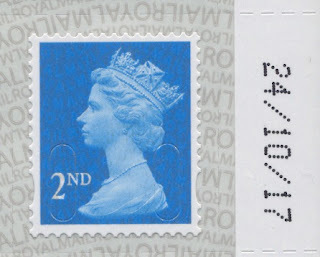 But it would certainly be easy to create a single of the "other" type by lifting the stamp and replacing it upside down. This would seem to apply to single stamps from booklets too. My own feeling is that there does not seem to be enough interest in this at present for anyone to try it on. But if they do ... don't pay them!!! I think that these things would be best collected, if collected at all, in some form of blocks. As a collector of complete booklets, I would think that these would be very difficult to fake. 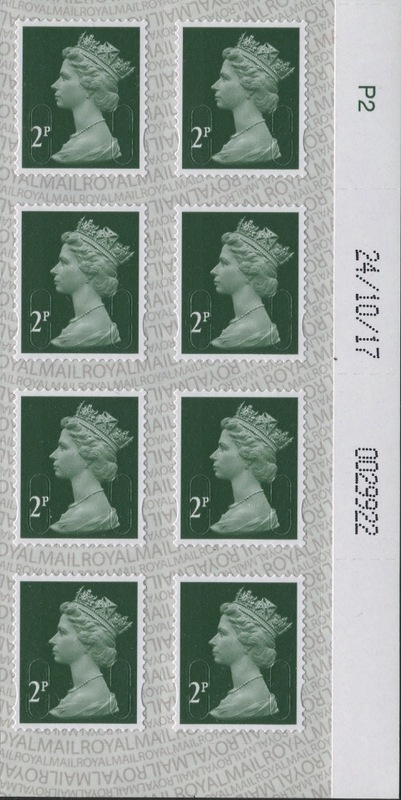 Not only would you have to replace every stamp and get it straight, but you would also have to get the columns of stamps lined up vertically and the rows of stamps lined up horizontally. 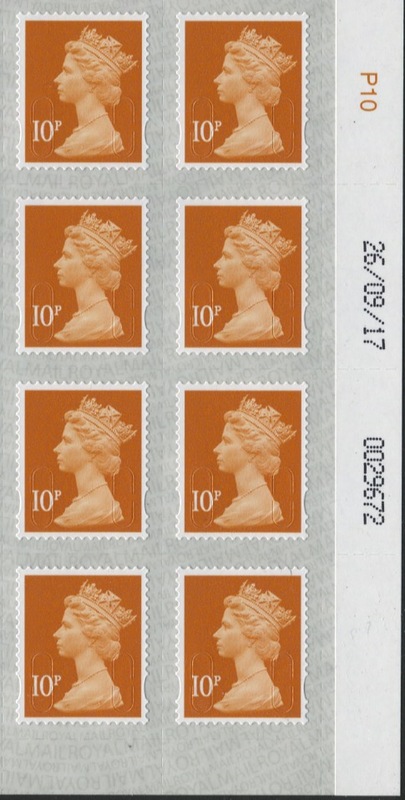 And every stamp would have to be lined up correctly with the edge of the booklet. Not that easy to be really convincing. So maybe these backing paper variants are not for singles collectors. But they still seem to be to be of interest to booklet collectors, cylinder or date block collectors or collectors of business sheet top panels. Or indeed, perhaps, to any collectors who collect blocks of stamps. 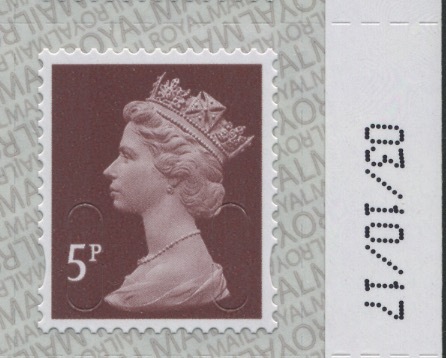 Die cutting of the perforations leaves a slight impression on the backing paper so it should be straight forward to check the position of the ellipses on any fakes. I find the descriptions of the SBP2i or SBP2u superfluous. For me it’s simple, there’s SBP1 (all upright) and SBP2 (alternating upright & inverted text irrespective of size) and that’s it! Plus it saves me money not having to have single nuance in the Machin series which in my opinion can end up ridiculously expensive. But, who am I to dictate what people collect, each to their own, this is just my preference. I totally agree with Sir_Lion's way of collecting and that is how I collect it too. 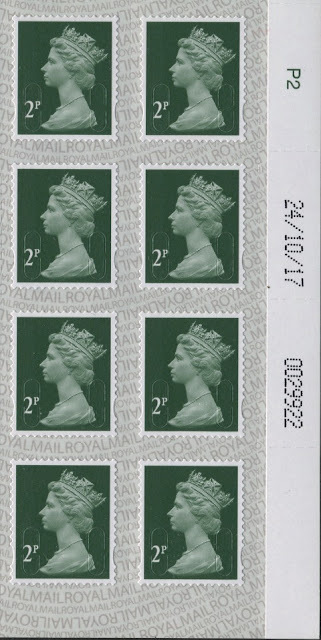 I know that the security backing paper, whether it is upright or inverted, SBP1 or SBP2 is not part of the actual stamp but it is part of the history of the development of the Machin definitive and all the security features that are now part of that stamp. However, at the end of the day it is down to the individual what they collect. Lets all just enjoy our hobby.